Now we can concentrate on piracy. I won’t comment on the morality issue; in the early 2000s I enjoyed debating philosophy online, but in three years I don’t recall changing anyone’s mind or anyone changing mine. It was great fun, but “multiplayer” philosophy doesn’t accomplish anything “single-player” can’t, so no ethics discussion. This talk is about numbers. 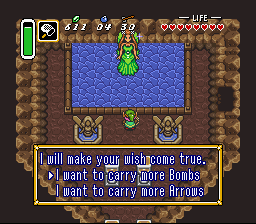 In Nintendo’s seminal SNES classic The Legend of Zelda: A Link to the Past, throwing enough Rupees into a certain pond draws out Venus, a fairy who offers Link a choice of holding 5 more bombs (at least until the final upgrade) or 5 more arrows. I’ve slowly been making a game in what spare time I have. Aside from the time investment, I’ve spent about $1023 on software tools and designing characters—pennies to a big publisher, certainly, but almost a full month’s after-tax, after-rent pay for me. Let’s say five years have passed, it’s the day before I launch my game, and I’m transported to Hyrule to meet with Venus. You know where this blog post is going based on its title, right? I believe you do! So click if it sounds interesting. This entry was posted in Editorials, Thought Food and tagged Indie Development, The Legend of Zelda on December 31, 2012 by JellyPaladin.